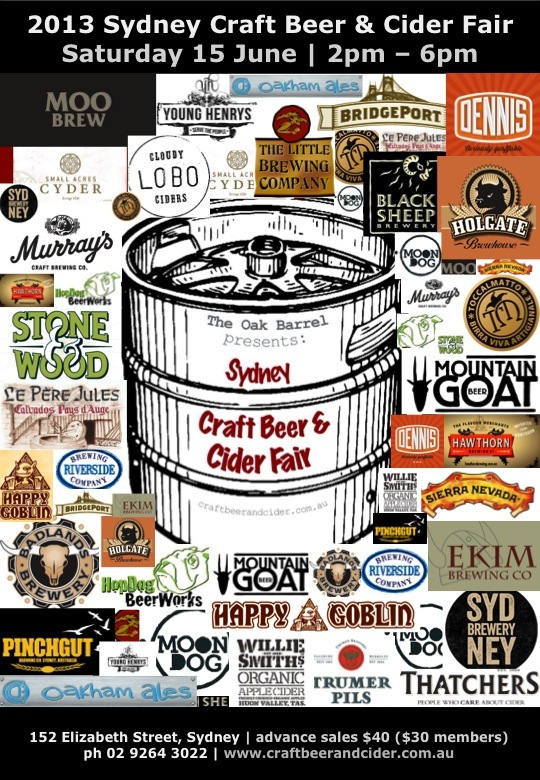 The Oak Barrel (In the CBD) will be holding our second Sydney Craft Beer and Cider Fair on Saturday the 15th June 2013. Showcasing Australian & International craft beer and cider. Due to the inaugural event selling out, this year we have expanded the area to be used in our cellar room & warehouse to allow for more customers and exhibitors but we will still maintain our quality over quantity policy. The fair will host over 20 stallholders each showcasing a variety of brands with over 120 craft beers and ciders being showcased. We have a plethora of Brewers to help explain the how and why .There will be Dave from Riverside, Colin from Happy Goblin , Tim from HopDog , the boys from Sydney Brewery and James from Small Acres Cyder to name a few.